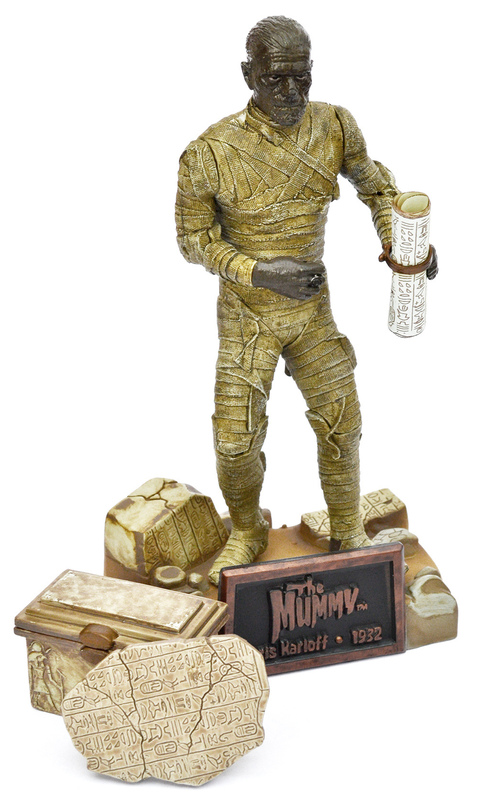 Universal Studios Monsters: The Mummy action figure by Sideshow Toy (1999) | 'TAIN'T THE MEAT… IT'S THE HUMANITY! Universal Studios Monsters was a collection of 15 posable action figures released by Sideshow Toy between 1999 and 2001. 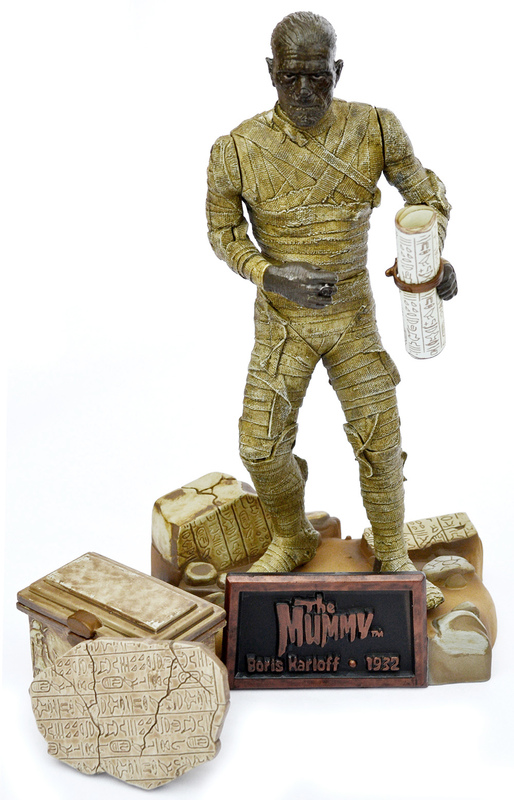 The collection was divided into five ‘Series’ of three figures each, with The Mummy being the last figure released from Series 1. Released by Universal Studios in 1932, and directed by famed cinematographer Karl Freund, The Mummy starred one of Universal’s most bankable horror stars: Boris Karloff. In the movie Karloff plays the evil Imhotep, a mummified Egyptian high-priest who has been reincarnated and seeks to bring his long-lost love back to life. But before he can succeed he is thwarted by the forces of good and finishes the film as a pile of dust. The Mummy was a big success for Universal Studios, spawning a while host of sequels and adding another star to its burgeoning roster of horror characters. This Universal Studios Monsters action figure was released by Sideshow Toy in 1999. The figure was made from moulded plastic and measured eight inches in height. The figure boasted 12 points of articulation and shipped in a cardboard-backed blister pack, the back of which showcased the other two figures released from Series 1: Frankenstein (which also starred Karloff) and The Wolf Man (starring Lon Chaney, Jr). 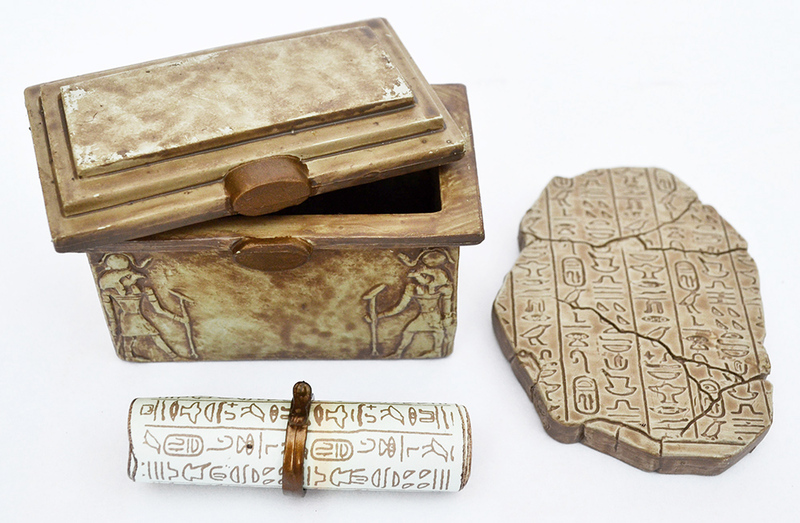 Included with the toy were three accessories: the Scroll of Thoth; a stone-effect slab with Egyptian hieroglyphics and a casket with a removable lid. Also included was a base with a nameplate bearing the film’s legend. The figure comes with three accessories. 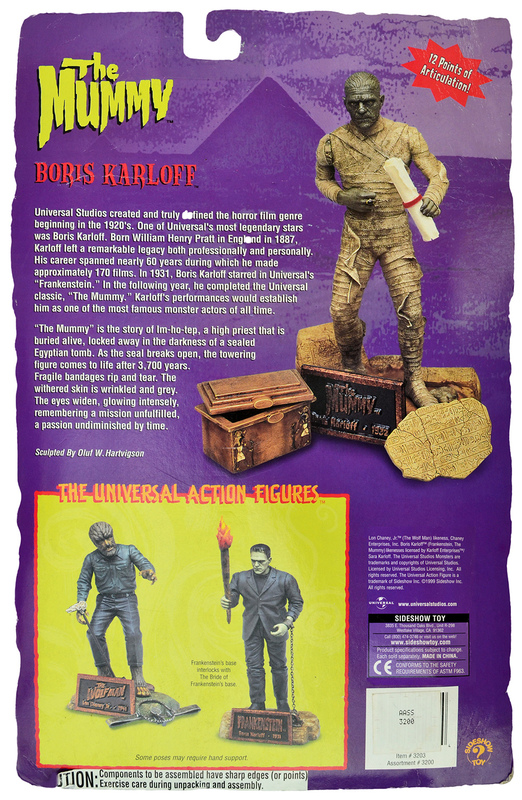 The Mummy action figure was based on a sculpt by Oluf W. Hartvigson, who also designed the other two figures from Series 1. As with those action figures Hartvigson did a bang-up job with The Mummy. The toy’s face featured an accurate representation of Karloff/Imhotep and there’s some nice detailing on both the bandages, base and accessories. The paintwork was also well done, particularly on the figure’s body. The inclusion of a the Scroll of Thoth is a nice touch as it can be flattened out revealing the hieroglyphics printed on it. 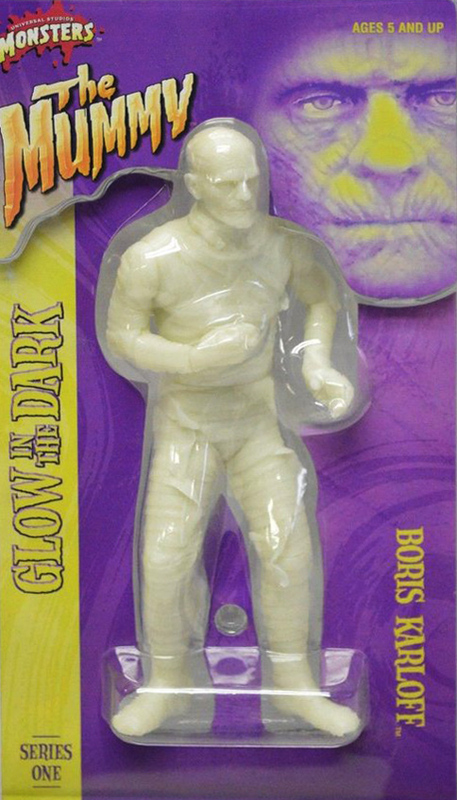 The glow-in-the-dark variant of The Mummy. 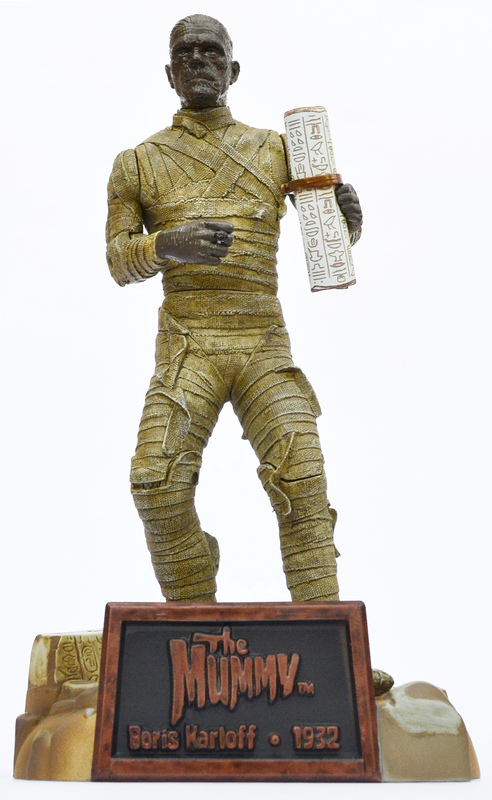 Sideshow Toy released three versions of The Mummy action figure. This one was the standard — or ‘Classic‘ — coloured edition, while a black and white Silver Screen Edition was also made available, as well as a glow-in-the-dark version. I’m not a great fan of the these variants though — the black and white version looks lifeless and dull, and the glow-in-the-dark edition just looks horrible (and not in a good way). Why anyone would want this pale insipid version is beyond me… it didn’t even ship with any accessories. The Mummy, from all sides. 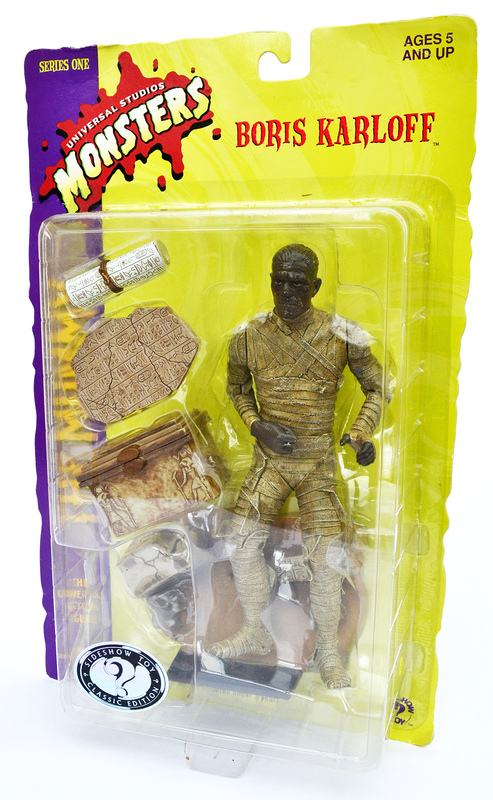 Due to the action figure’s age it’ll come as little surprise that The Mummy is well out-of-stock. It can still be found an ebay and other auction sites but a new one will set you back anything from £25-£60. But for fans of the film (and of Universal’s classic horror films) it’s well worth unearthing. I’m a great fan of all these action figures — and of the films they are based on — and these figures from Sideshow Toy rank as some of the best in my collection. Next: Lon Chaney’s The Hunchback of Notre Dame is immortalised in action figure form.